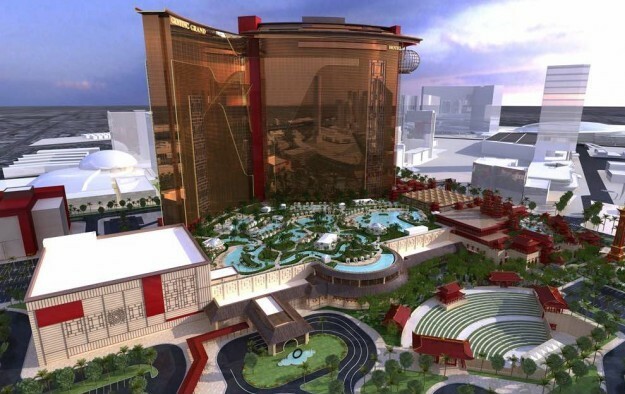 Resorts World Las Vegas (pictured in an artist’s rendering), a casino project in the United States to be developed by Genting Americas Inc, is one of two pending resort schemes in the Nevada gaming hub most likely to face delays, said a Wednesday note from Telsey Advisory Group LLC. “The most likely new openings to be delayed would be… Resorts World Las Vegas and The Drew,” wrote analyst Brian McGill, referring first to a scheme from a unit of Malaysian casino group Genting Bhd. “However, both properties recently came out and said they expected openings in 2020,” he added. In an October announcement, Genting Americas mentioned targeting a 2020 opening and described Resorts World Las Vegas as a “multibillion-dollar integrated resort”, but didn’t specify the current budget. Investment analysts have previously mentioned a US$4-billion price tag. It has previously been trailed as a resort designed to appeal to Chinese and other East Asian gamblers. Since then the threat of a trade war between the U.S. and China during the current administration of U.S. President Donald Trump has been highlighted in a risk assessment report as possibly dimming the business prospects of the U.S.-based Macau casino investors. Commentators in the U.S. have also pondered whether Chinese tourism to Las Vegas might also be hurt. Mr McGill’s comments about possible delays to Resorts World Las Vegas were in the context of likely demand during 2019 and 2020 for new slot machines in the North American casino market. “As a rule of thumb, it is expected that slots will ship into [a] property 60 to 90 days ahead of the opening. This is when the manufacturers will recognise the sale typically,” he stated. The brokerage expects that over the next three years a total of 43,093 slots would enter the North America casino sector via new casino openings and expansions to existing properties. “We generally think this is more than the market [investment community] expects,” said Mr McGill, adding that this was likely to be “favourable” for casino equipment supplier Scientific Games Corp, one of the companies covered by Telsey Advisory.